By Aaron Doyle | December 3, 2014. Secondary school teachers around the Liberties took part in a one day strike yesterday over proposed reforms to the Junior Certificate exams. 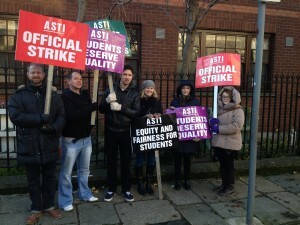 Teachers in St. Patricks Grammar School, Synge Street CBS and Presentation Secondary School in Warrenmount held picket lines outside the main entrances of their schools to protest against the changes. “It’s for equality and fairness in the education system” said Paul Tester of Synge Street CBS. “Before that, it was corrected anonymously by people from different parts of the country so everybody gets a fair shot and as it is with all the cutbacks, schools like ourselves that have been designated a DEIS school for disadvantaged students, It’s been further disadvantaged arguably by this” he added. “We feel it is very important. It is sending out a message to the public and everyone at large that we are not going to accept the unfairness of the new system. There are smaller issues but the biggest issue is definitely the marking” said Mr Barrett. The teachers in St. Patrick’s Grammar School also support the strike as they see the new reforms as unfair to the students that teachers will have to correct their own students’ exams. They are concerned that it will impact negatively on their relationships with students. “We are not going to put our students at a total disadvantage where biased teachers and advocates for them are now being turned into their judges. I think it is totally unfair on the students,” Mr Barrett commented. “There are a lot of issues with the schools at the moment with all the cuts that we’ve had. There are serious issues that aren’t being dealt with and to try and push this through when there are so many other problems that need to be fixed first seems crazy,” he added. Barrett said that teachers have supported a lot of the new proposals. “We are definitely open to reforms. There are a lot of great proposals in the new junior cycle. Having more practical based subjects seems very sensible. It’s just that the main issue is how we are going to do it we don’t have the resources to do it and the fact that the teachers are going to have to be the judges is the big issue. We are onside on certain issues but on others no we don’t agree”.